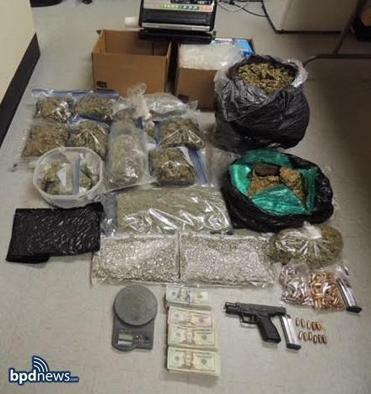 Boston Police seized more than 40 pounds of marijuana from a suspect’s car and residence on Saturday. A Mattapan man was arrested Saturday afternoon after investigators found more than 40 pounds of marijuana in his car and home, police said. Howard Robinson, 48, was charged with distribution of marijuana, possession of marijuana with intent to distribute, as well as a variety of gun charges, Boston police said. Officers saw Robinson driving on Armandine Street on Saturday and witnessed a drug transaction, police said in a statement. They stopped his car and arrested him, then recovered a .45-caliber Glock Model 30 pistol, multiple bags of marijuana weighing approximately four pounds, over $7,000 in cash, and two cellphones. Robinson was arrested around 12:40 p.m., police said. Police then searched his home at 52 Selden St. and found a loaded Springfield Arms .40-caliber pistol, 158 rounds of ammunition, an additional 40 pounds of marijuana, over $19,500 in cash, and paraphernalia and packaging material consistent with the sale of marijuana, police said. Police said they would seek additional gun and drug charges against Robinson following the search of the home.